To request an appointment online, please fill out the form below for your son or daughter. Click the “Send” button to send the request and a member of our team will be in contact with you within 24 hours. Thank you! The qualified staff at Hines Little Smiles, in Columbus Ohio, have made it our goal that each child’s visit is a positive experience. We know that a trip to the dentist can be intimidating and sometimes scary, not just for adults, but kids too. So that is why from the minute they enter our office, your child, will be greeted by friendly staff that communicates at your child’s level. We explain each procedure and process to them so that they understand and are excited about their appointment. You will notice that your children will become more engaged and actually listen and learn about healthy dental habits. Our spacious waiting area has room for both parents and children. We have furnished it with fun tooth shaped chairs, children’s books and magazines, and included fun activities your son or daughter can do to feel more at ease as soon as they enter our office. 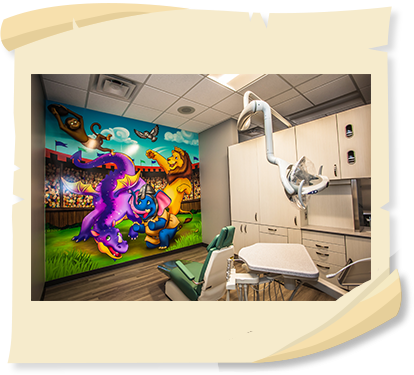 Also In our procedure rooms, we have TV’s in the ceiling so your child can watch a show or cartoon to help them relax as we examine and clean their teeth. We also keep a prize cabinet fully stocked with various rewards to help motivate children to do their very best to take care of their teeth. Additionally if they have no cavities they have the opportunity to join our Cavity Free Club! It’s our special club for kids that motivates them to keep a healthy smile throughout the time they come to our practice, and for the rest of their lives! Dr. Hines, Dr. Anderson, Dr. Norman, and Dr. Pagé will involve your son or daughter with all of their care and explain each procedure in a way that they understand. 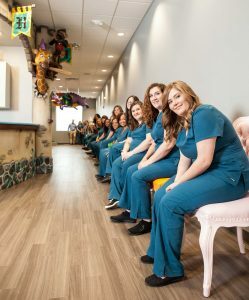 All of the staff here at Hines Little Smiles have had special training and experience working with children specifically and also how to provide dental services to children with special needs. Every child deserves to have a beautiful healthy smile and that is why our training helps us as we teach them about brushing and flossing in a fun and interactive way. We have worked hard to create an environment to help our young patient overcome the fear of making a trip to the dentist. We want the whole experience to be fun, educational and memorable. Dr. Hines, Dr. Anderson, Dr. Norman, and Dr. Pagé understand that your child is more than a healthy smile. That is why it’s a part of Hines Little Smiles’ mission to give your children the full attention that they need, while making them feel smart and important. With years of experience Dr. Hines, Dr. Anderson, Dr. Norman, and Dr. Pagé are able to communicate with and be understood by children of all ages. They want them to become excited about their dental treatments. And all of the staff believe that these positive and fun dental health experiences we make will stay with your child. It will be the beginning of a solid foundation of proper habits that will stay with them well into adulthood! Here at Hines Little Smile we know that dental care can be fun and exciting! Each visit will be memorable for your child and they will look forward to visiting us twice a year!